Nokia C6 looks similar to 5230 Expressmusic from front and Slider keypad is like Nokia N97. 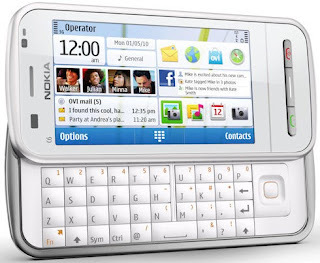 C6 features GPS with OVI Maps, Nokia messaging and older Symbian series 60 platform. 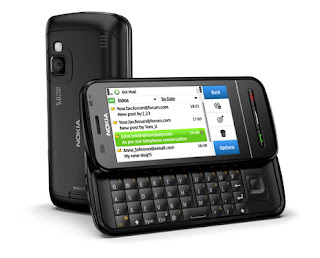 Updating your status, on for example Facebook, is easy and fast with the Nokia C6 Smartphone. But also the latest updates from your social contacts appear immediately so that you will remain up to date about your social network at all times. The Nokia C6 smartphone also has a Map application on the start screen with which you can navigate. The Map application is free to use, but also the ‘Lifetime Walk & Drive’ navigation belongs to the standard package. In practice, you will be able to easily and effectively find your appointment or route with the Nokia C6. Of course the Ovi Store also belongs to the possibilities to download all kinds of handy software applications for the Nokia C6. The Nokia C6 is an interesting new smartphone with handy messaging possibilities aimed at a broad audience that is especially actively mobile. Its really a gadget for value . It has mostly all the tech specs of nokia n97 and comes with really an affordable price of 13,000 INR . Recently my sister bought this phone on the first day of its launch in India and its a really good phone . You have all that you want in your pockets . Its ovi store and its applications doubles the value of it . the battery backup is good but the only drawback i think is the music volume is low , though its output on the speakers is really great . Afterall , nokia c6 is doing really good in the stores and i recommend for this phone .